Regal purples and soothing greens combine to make a beautiful tribute to someone whose memory you will always treasure. 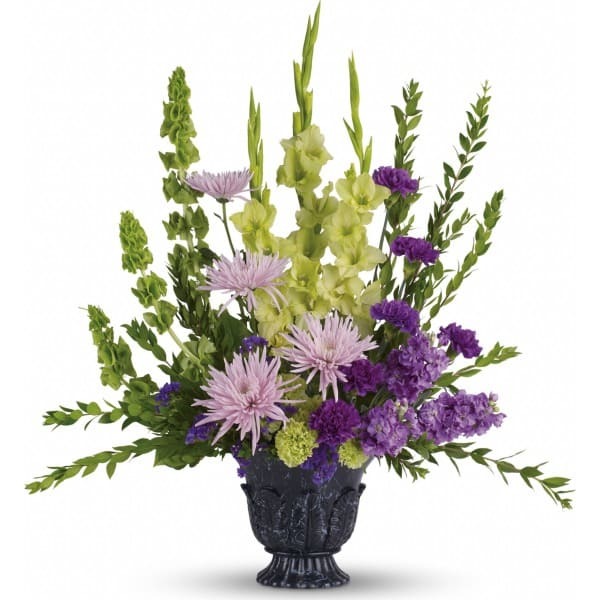 • This serenely beautiful bouquet includes green gladioli, green carnations, purple carnations, lavender stock, lavender spider chrysanthemums, bells of Ireland, purple sinuata statice, accented with assorted greenery. 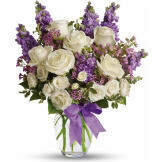 • This arrangement can be delivered for the funeral service or directly to the family residence. • Arrangement measures approximately 29" W X 31" H.
Flowers will be received by a Marshall-March Funeral Homes' staff. All of our flowers are designed and delivered by hand from a local florist in in Suitland.